A life-saving Kenya fire service has been started after the donation of a fire engine from Bedfordshire. Now three more engines are being added to the original vehicle. The President of Kenya has sent his thanks back to the people of Dunstable and to the Chief Fire Officer of Bedfordshire Paul Fuller. The idea started with a Church related-charity: the Onset Trust and Pastor Douglas Richards of Dunstable Community Church. 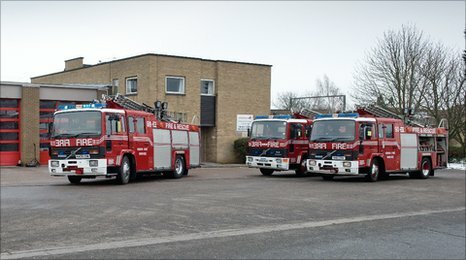 The church approached Bedfordshire and Luton Fire and Rescue Service to ask if it could purchase an old fire engine to send out to Meru in Kenya where no fire service existed and deaths from fires are common. The Combined Fire Authority (CFA) members decided they would give a vehicle which was going out of commission. Then BLFRS Transport and Engineering Manager and retained firefighter Ray Willett got involved. Only too aware that the fire engine is no use without a mechanic to keep it on the road, he and two colleagues travelled with the vehicle to Meru. A gruelling but enlightening trip saw Ray and colleagues set up the first ever fire training course in 2008. Within days the fire crews had stopped a school fire spreading. Within weeks they had saved the lives of two children. Since then more than 70 fires have been tackled – fires which would otherwise have swept through communities who live closely together in wooden properties. 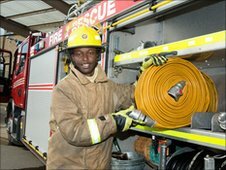 Joseph Githuka Njoroge was invited to the UK as a guest of BLFRS to undertake nearly seven weeks training to learn skills which he is now sharing back in Kenya. Earlier this year Fred Akandi a Kenyan who is a member of the Dunstable Community Church, and Ray Willett approached the CFA and said they has raised a further £3,000 and could they buy another two fire engines . The Authority decided to donate three vehicles which were going out of commission to the charity on condition that the £3,000 was used to fund additional initiatives in Kenya. The three vehicles will go to Mombasa, Meru and Maua. They will be followed in February next year by Ray and a party of 24 volunteers, including two Paramedics and five Community Fire Safety Officers, who will run training programmes and spread the community safety word.